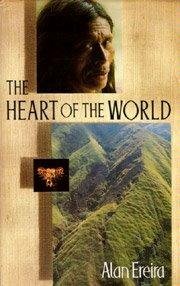 Another documentary, along with John Romer’s Testament and the Blair Brothers’ Ring of Fire, which had an early influence on my chosen path of study was Alan Ereira’s From the Heart of the World (1990). This film combines my two main interests, archaeology and anthropology, two subjects which I would go on to study at university. The film begins with an account of the Tairona, a group of Pre-Columbian cultures which formed a sophisticated civilisation that flourished in South America in the centuries preceding the Spanish Conquest in the 1500s. 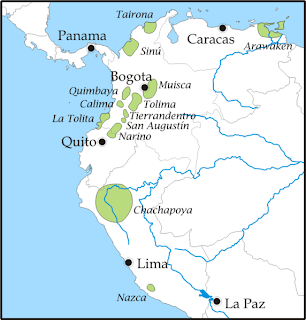 The remains of their ancient citadels can be found in the mountainous jungle region of the Sierra Nevada de Santa Marta on the northern coast of Colombia, the world’s highest coastal mountain range. 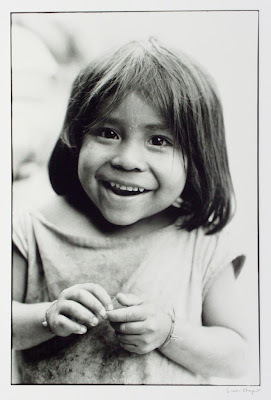 Like most of the Pre-Columbian peoples of South America they were decimated by the Spanish Conquistadors who plundered their cities primarily for gold, and then subsequently exploited them and their lands, marginalising and oppressing their native culture. The film outlines this history whilst illustrating the remains of their roads and cities, which were finely attuned to their environment and constructed in such a way that meant they were not washed away by the frequent rains but instead channelled and made use of the water. The film lets the archaeologists and looters, who have each worked the sites to their own ends, speak of the remarkable things they have found, before finally introducing the Kogi people. 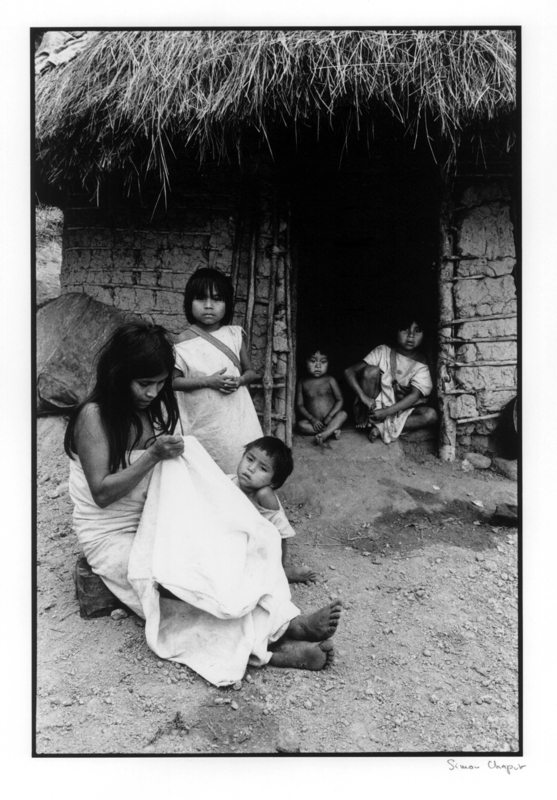 The Kogi are the modern day descendents of the Tairona culture, an indigenous group who still live much as their ancestors may have lived, in isolation from the rest of Colombia and the wider world. The overall premise of the film was a truly prescient one. First screened on BBC television in 1990 it was a bombshell. I remember at the time it was widely talked about. 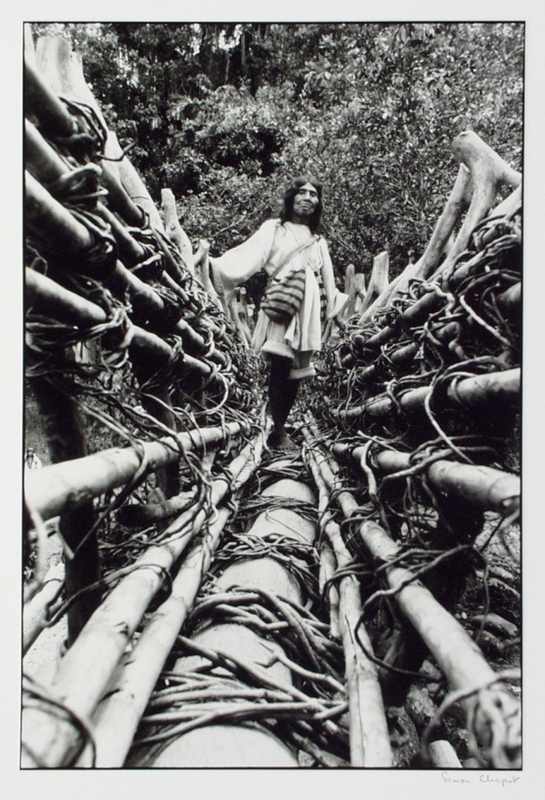 The Kogi, we were told in the opening narration, had asked Alan Ereira to come to the Sierra Nevada de Santa Marta to make this film because they had a message to give to the world. The message was one which spoke of the harm which we, in the modern world, were doing to the environment. They were concerned that mankind’s actions – in mining, logging, extracting minerals and oil, intensive farming techniques, industrial air and water pollution, etc – were damaging the Earth. If we didn’t stop, they warned, we would destroy the world. This remarkable message came right at the beginnings of the debate concerning man-made climate change. Their message was clearly an early warning about global warming. The Kogi are a people who still live very close to nature, a sedentary subsistence farming culture, their lives and their social structures are bound to their mountain environment and the ecosystems which make up the Sierra. They had noticed how the natural water cycle of their mountain was changing. The top of the range was drying out and the snows were retreating, meaning the annual melt-waters were diminishing, and this in turn was having a detrimental knock-on effect down the mountain side, through the different climate zones which they so adeptly utilise, right down to the sea itself. The Kogi’s society is seemingly centred upon maintaining an actual as well as a spiritual balance with nature, but not just in their own world. They see themselves as the Elder Brothers of the human race. They are attuned to the elemental force within nature, and they believe that it is their duty to maintain that balance and harmony for the good of the Earth and all mankind. But, we – the Younger Brother – are threatening this stability by our ignorance and through our insatiable greed. At the time, many agreed that this was an unprecedented clarion call which we would do well to heed. In essence, the film prompted me to think more broadly. I didn’t realise at the time, but it suggested a multi-disciplinary approach to the contemplation of history and culture. It also appealed to me on an ethical level too, with its highly contemporary view towards environmental conservation issues and the need to preserve natural spaces in which traditional societies could be allowed to continue to exist as they chose, rather than encroaching upon them, marginalising, or, at worst, forcing them to abandon their lands and livelihoods at the behest of over-reaching big business interests and advancing globalisation. This film, and Alan Ereira’s book, ‘The Heart of the World’ (1990), helped me to see how all my various interests could essentially come together as one interrelated and integrated whole. I later met Alan Ereira. 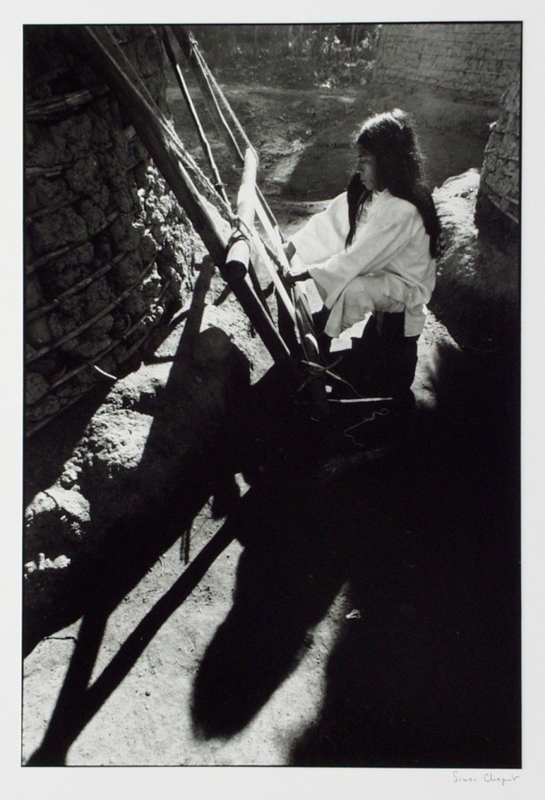 Around ten years ago, I assisted him when he was filming ancient Greek vases for one of his documentaries. Unfortunately, at the time I didn’t feel it was appropriate for me to broach him about his work with the Kogi, although there were countless questions I would have loved to have asked him at the time. I regret now that I didn’t. 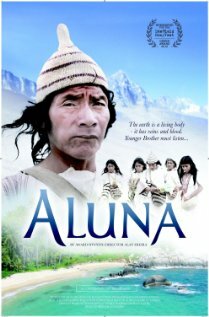 I recently read that he has since made a second film about the Kogi which was officially released last year, called ‘Aluna’ (2012). ‘Aluna’ is the Kogi’s name for the spiritual world which they believe binds reality and all living things to ‘the Great Mother,’ that elemental force within nature which is essentially the Earth itself. You can find out more about the new film here, and view extracts from both the original and the new films here. The Tairona Heritage Trust website contains more information on the Tairona and the Kogi, as well as providing references for further reading. The two films will both be screened later this year at the Orkney International Science Festival(September 5th, 2013), find out more here. 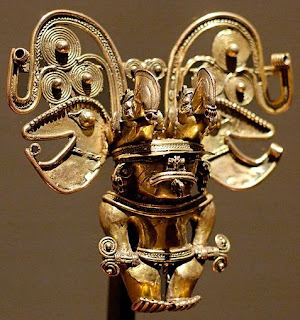 The British Museum, working in partnership with the Museo del Oro, will host an exhibition later this year, titled: 'Beyond El Dorado: Power and Gold in Ancient Colombia' (October 17th 2013 - March 23rd 2014). The exhibition will include some exquisite Tairona gold work. I’d like to express my thanks to the photographer, Simon Chaput, who has very kindly and very generously given me permission to illustrate this piece with his own images of the Kogi. His are by far the best images of the Kogi which I have seen. You can find out more about Simon Chaput and his remarkable work on his blog.